It is estimated that without adequate surgical services, 10% of a country’s population will die from injuries and 5% of pregnancies will result in maternal death. A woman with breast cancer in the United States has an estimated 89% chance of surviving five years; in sub-Saharan Africa, a woman with breast cancer has a 32% chance. Appropriate surgical intervention is one of the key differences in these survival rates. Improving access to quality surgical care in developing countries has the potential to dramatically decrease the morbidity and mortality that result from not just one disease, but from a wide range of surgically treated diseases. An estimated 234 million operations are performed annually, but the quality and access to care for surgical patients varies widely. Surgically treated diseases range from the treatment of cancer to the repair of a fractured bone after an automobile accident to the delivery of a newborn by cesarean section from a mother with obstructed labor. The World Health Organization (WHO) estimates that by the year 2020, injuries due to road traffic accidents alone will exceed the impact of HIV, TB and malaria, all diseases that currently receive the bulk of public health funding. 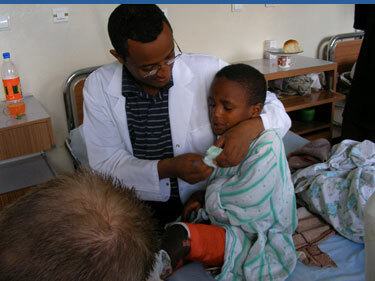 The challenges to improving surgical services in the developing world are myriad. Reliable data to help inform policy decisions is emerging but scarce. Understanding the patterns of injury and other surgically treated diseases and the barriers to access to surgical care in developing countries is critical. Without a basic understanding of the problem there can be no long term solution; a young woman with obstructed labor in Gambia, a father with punctured lung in Senegal, or a mother with breast cancer in rural Cameroon will continue to die every year. According to estimates from the WHO, death and disability due to trauma in Cameroon is on par with that caused by malaria. Unfortunately, most of the data sources that the WHO relies on to make these estimates are of poor quality and are thought to grossly underestimate the problem. In order to best design programs and policy to prevent and treat diseases that are amenable to surgical intervention, the nature and extent of the problem needs to be better understood. We believe that this can only be done by partnering with local experts and assisting them in the manner that they see best fits their local culture and practice.